I thank Mark Peck of the Royal Ontario Museum and Yves Aubry of the Canadian Wildlife Service for inviting me to help with Red Knot research on the Mingan Archipelago on the north shore of the Gulf of St. Lawrence in Quebec. See two detailed reports Page 4. 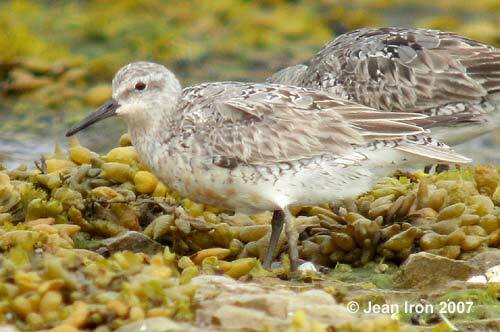 We surveyed Red Knots and other shorebirds on Ile Quarry, Ile Niapiskau, Grande Ile, and Ile Nue. 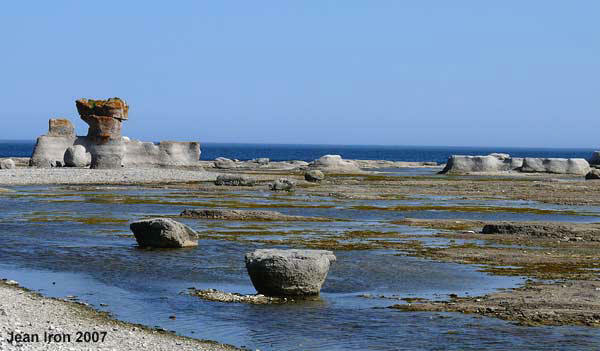 The outgoing tide exposes flat limestone rock (platiers in French), seaweed and a myriad of tidal pools teeming with invertebrates. Ile Quarry above. During the day, we counted Red Knots, and looked for flagged and banded birds. Red Knots fed at the edge of the tide among the seaweed. Ile Nue, 25 July 2007. We often saw flocks of 500 and 800. 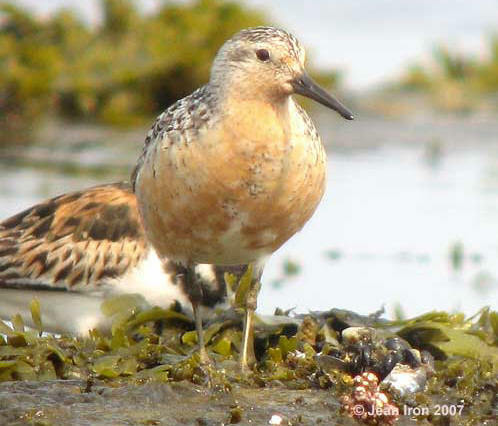 Red Knots were molting from alternate (breeding) plumage into basic (winter) plumage. Grande Ile, 26 July 2007. Red Knot banded the first night on 18 July 2007. This individual was seen again on 29 July and 3 August indicating a stay of at least 21 days, demonstrating the importance of the Mingan Archipelago for staging southbound knots. White flag means banded in Canada. 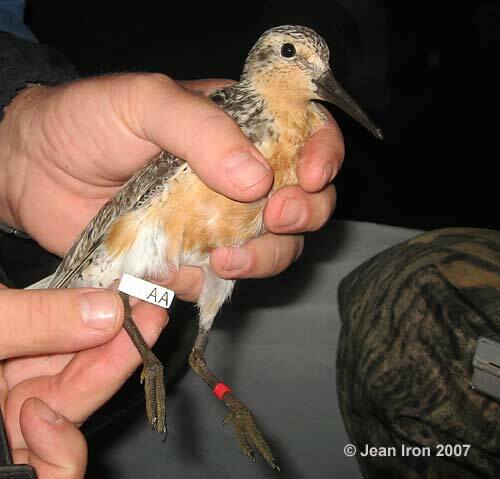 In April 2007, COSEWIC (Committee on the Status of Endangered Wildlife in Canada) added the eastern Red Knot Calidris canutus rufa to the Endangered Species list. End of Page 1. Now go to Page 2.